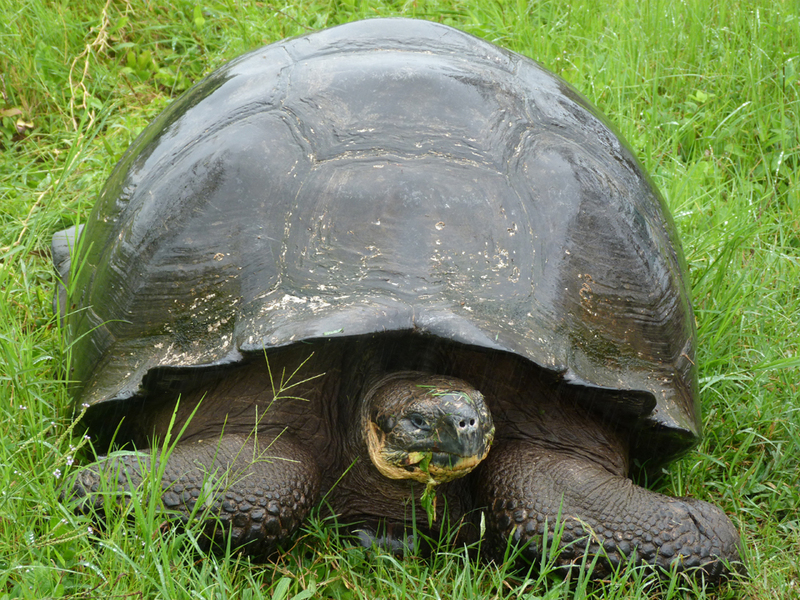 The Galapagos Islands – Words cannot really describe how fascinating a place this is. Look at our video below. Enjoy! We flew to Quito. Flight early New Years morning to Amsterdam. Less than an hours turn-around, then an 11.5 hour flight to Quito in Ecuador. Panoramic view from our balconies with a volcano in the distance. We had free time today to relax, recover from the flights. We were sent to HotelQuito as The Sierra Madre had plumbing problems. Bonus! The weather was far hotter than we had expected, and, as this hotel had a pool, it would be rude not to spend the day beside it. Both Mike and Dave had problems breathing at that altitude. Mike also had a headache. Everyone apart from Dave got some sunburn. We ate in at the hotel that night. The restaurant having a fabulous view right over the city. We also started to meet some of the other people who were booked on the same Galapagos trip. A Half day trip around Quito. Dave was surprised when we passed an old observatory, and just had to get a picture of the old building as the bus passed. The Old Town was very interesting and we had a tour of the town and an old Cathedral. Mike thought that the imagery used in the cathedral was quite disturbing and intimidating and showed how people were controlled at that time. We went right up to the statue of the Virgin Mary right up on the hill to get a view of the city. We were going to eat out in a fish restaurant close by that night, but it was absolutely pouring down with rain so we ate in the hotel again. Day 4 – 4/1/2012 – Now it gets really exciting! We returned to Quito airport for the flight to Galapagos and the island of Baltra in The Galapagos Islands. We landed in drizzle! We took a short ferry crossing to Santa Cruz Island. We were very surprised to see a heron sitting on the roof of a boat, hitching a ride. We drove to the highlands to look for wild tortoises. At a farm we saw our first wild tortoises, one blocking the road. One of our first Wild Tortoises. At the farm we was some more tortoises wallowing in the mud, one of which let out a very loud fart! There were some White Cheeked Pintails and birds of various kinds. There were also two Barn Owls roosting in the shed. We picked up Andrew and Monica, who had been waiting there over 4 hours in the rain to meet us. We were told that it has been raining up there since April 2011! We drove back down the other side of the island into the Sun to Porta Ayora to have lunch. We followed this with a visit to the Charles Darwin Centre, where we learnt about the ecology of the islands and visited the centre’s tortoise hatchery. We saw our first marine iguana by the side of the road on the way. That was another very interesting place and also spotted a Galapagos snake. After the Darwin centre, we walked round to meet the boat – Cachalotte. 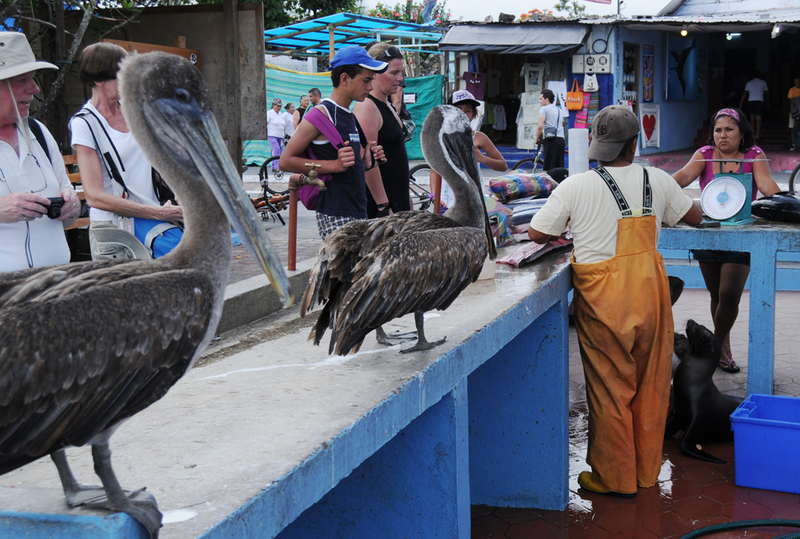 We saw some frigate birds hovering round by the docks and noticed that there was a fisherman carving fish for sale. We were very surprised to see that he was being watched by three Pelicans and a Sea Lion who were hoping to pick up some scraps. You can just see the other pelican and the sea lion under the counter behind the fisherman. There were lots of fish in the water near the jetty. We board the boat at Puerto Ayora, the island’s main town. We had an evening meal on the boat and after dinner we started to sail. Our fire alarm went off in our cabin at 1:30am. Not a single crew member came to investigate! Day 4 – 5/1/2012 – Chinese Hat and Isla Rabida. We had a wonderful first walk amongst the sea lions with pups, marine iguanas and penguins (one swimming along the beach). There were Sally Lightfoot Crabs and 2 Galapagos hawks, one adult and one immature on the beach. You could walk right up to them to take their pictures. After a short rest Dave went snorkelling and saw, Penguins Swimming, a Marine Iguana eating underwater and three white tipped reef sharks. Sue, Carol & Mike snorkelled from the beach. 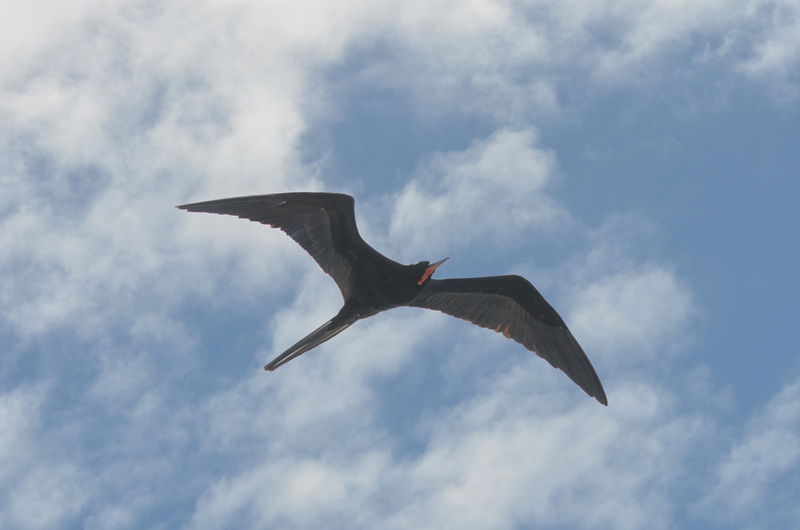 We then sailed on to the dark red beach of Isla Rabida to walk amongst spatter cones, pelicans, Blue-footed and Nazca boobies. Sue & I snorkelled and saw penguins swimming and marine iguana’s. Lots of fish, no sharks. Day 5 – 6/1/2012 – Poto. Villamore, Los Tintoreras & Sierra Negra. We docked at Poto Villamire, starting three days exploring the largest island of Isabela with an exploration of the mangroves at Los Tintoreras in the early morning. 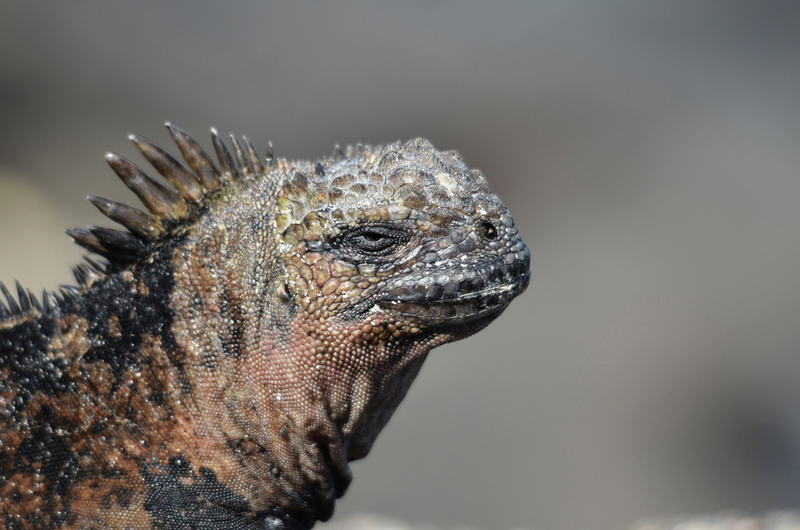 We stopped at a main marine iguana breeding site, lots of iguana’s, both big and small. 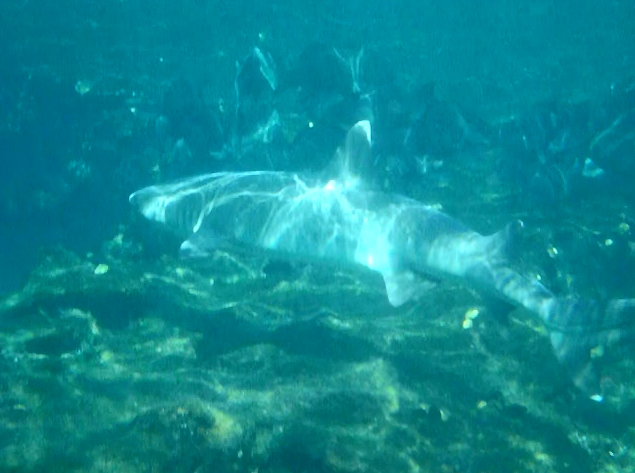 Sue and the boys saw and photographed three white-tipped reef sharks swimming into the channel as we were leaving. Sadly we couldn’t go back as time was short. We then went across to the mainland in the zodiacs and were amused to see sea lions that had jumped into some boats to sleep. We then took a very bumpy bus ride over to the tortoise breeding centre. We then walked across a board walk through a mangrove lagoon and saw some flamingo’s, more marine iguana’s and fiddler crabs. We walked back to town to have lunch. We took a bus up to walk to the huge 5-mile wide caldera on Sierra Negra volcano. However when we got there it was too cloudy to see anything, so we took a slow drive back down to look at the changes in vegetation and try to capture some birds. Back at Poto Villamire we stopped for a beer and then went back onto the boat to meet Birgitta and Stephan who joined the cruise a little late. Day 6 – 7/1/2012 – Punta Moreno & Elizabeth Bay. 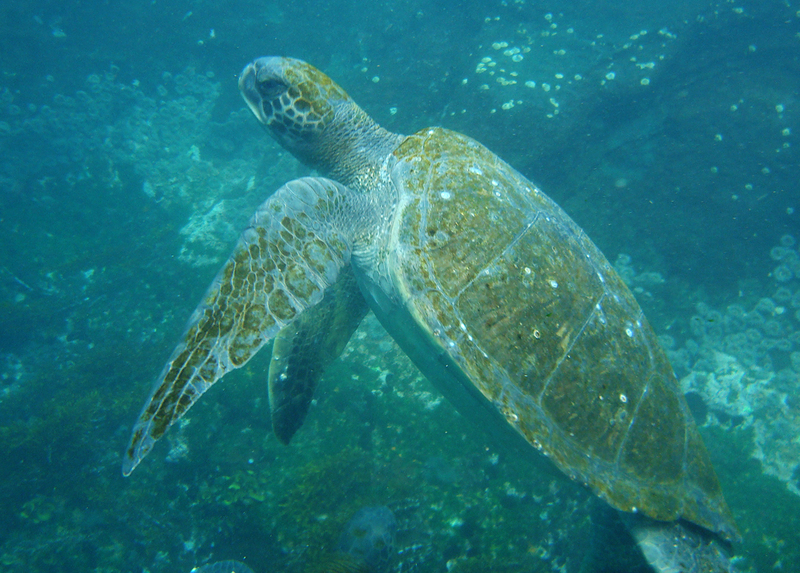 We landed at Punta Moreno’s swirling fresh lava flows and Lots of turtles seen in the water around the boat first thing. We also saw a Manta swim past. Walked across a fresh lava flow looking at pioneer plants. We were surprised to see ferns growing in cracks in the lava. There were sink holes filled with brackish water, with mullet swimming around in them. There were lots of finches and a couple of flamingos were seen in the sink holes. There were no iguana’s in the area as there are feral cats that live wild here. We could see spraints on the lava to prove the point. We snorkelled late morning in very green water. Sue was extremely excited and fulfilled to discover that despite the murkiness there were lots of green turtles swimming all around us. They were very relaxed grazing on the algae growing on the rocks. There were quite a few other fish around as well. I didn’t get any pictures as I left the camera in my snorkelling bag on the zodiac, but it was great to see these creatures up close and personal. also explore the islets of Elizabeth Bay with the largest colony of penguins in the Galapagos. We anchored at E. Bay in the afternoon and went on zodiacs into the mangroves. We saw lots of turtles, Boobies and flightless cormorants. We saw two turtles mating on the way in. After a while the guys switched the engines off and paddled us slowly and quietly around the mangrove. Sadly, we came across a dead sea lion caught up in the mangroves. There were lots of mullet in the water and a heron flying across the shoal really spooked them with an explosion of water as they flicked their tails to get away. Then we heard a strange sound in the mangroves. We approached cautiously and there we were highly amused to find three sea lions right up in the mangrove branches asleep and snoring loudly. On the way out the two turtles were still at it! Day 7 – 8/1/2012 – Urbina Bay, Tagus Cove & Darwin Lake. We arrived at Urbina Bay just as it was getting light, passing large colony of penguins on the islands, which cannot be visited at all now. As I was finishing breakfast, I saw the back of a whale break the water. I saw the whale blow twice more, but no-one else but me and the captain saw it before it disappeared. In 1954 Urbina Bay was uplifted 4 metres and we walk here amongst exposed coral heads, wandering giant tortoises and huge land iguanas. The surf was quite rough and made for amusing landing on a black sanded beach! There were visible turtle nests on the top of the beach. We walked inland and saw lots of finches, land iguana’s and some tortoises. We came to the old beach that was raised up in 1954. A great land iguana nesting site. There was dead coral on the path. Looking at the changing vegetation. Due to the strength of the surf we did not snorkel that morning. We then sailed to Tagus Cove and Darwin Lake, directly opposite recently active Fernandina Volcano. Snorkelling along the wall was fantastic. Lots of turtles, penguins and sea lions. Lots and lots of fish. Magnificent! Late in the afternoon we walked along a path beside Darwin Lake. Boy was it hot and muggy! Saw lava flows along the valley right the way down to the sea. On our way back down a sea lion further amused us by blocking the steps down to the beach. Our tour guide Sylvia had to shoo him out of the way by getting us all to clap our hands. What fun! Day 8 – 9/1/2012 – Punta Espinosa, Punta Vincente Roca & The Crossing the Equator. Set sail as the near-full Moon was setting and the Sun was starting to rise. Left Tagus Cove and had an hours crossing to Punta Esponisa on Fernandina in the midst of a huge colony of Marine iguanas. 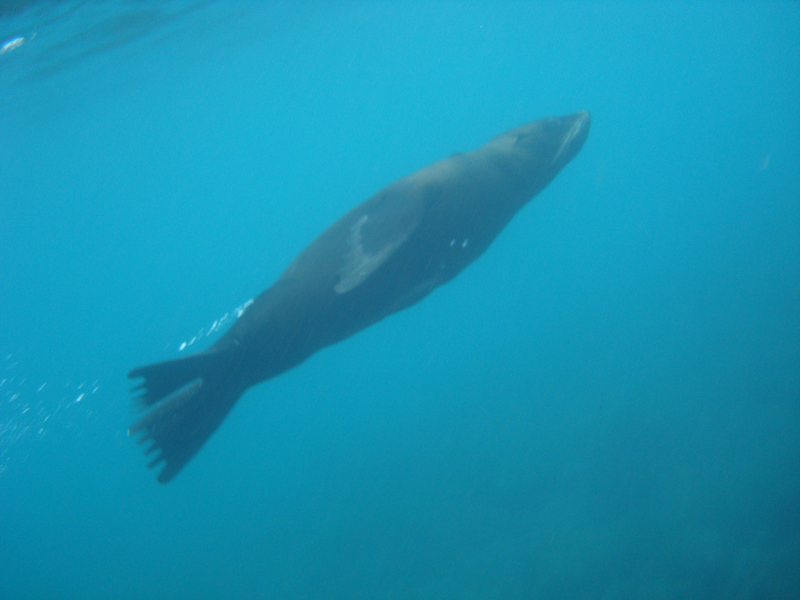 The sea life is very rich here and supports a large sea lion and fur seal colony. We went ashore and there were marine iguana’s everywhere, that we had to be extremely careful where we were treading. Lots of Sea lions, Sally Lightfoot crabs and, oh yes, did I mention Iguana’s? Especially excited were the big males fighting on the rocks. One mating pair were really hassled by other big males. There was a dead sea lion on the beach, whale bones and a sea lion skull. We snorkelled off the beach close to the rocks. The visibility was not very good and the water was quite green, but there were lots of turtles and fish. We then crossed the straights (Saw a whale blow 5 times but never saw the whale itself). Dave snorkelled alongside the cliffs and large cave. 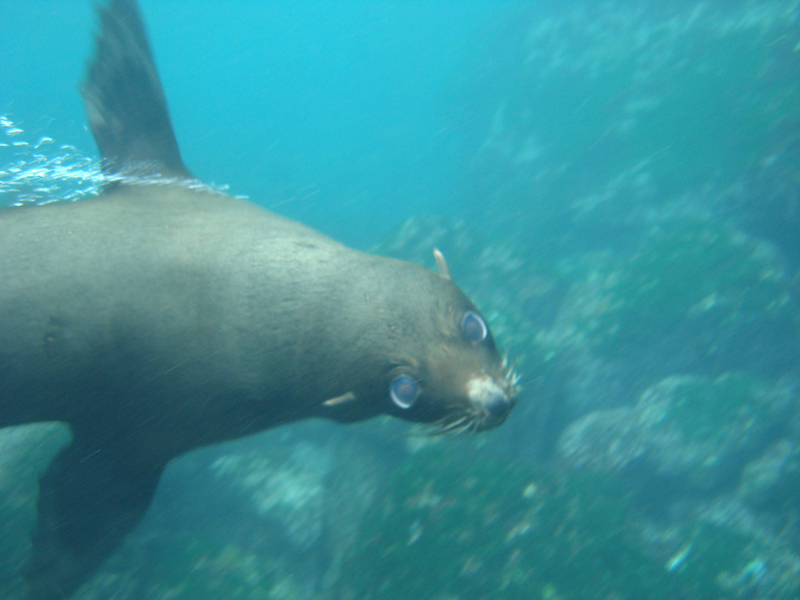 A sea lion was hitting a fish against the water in the cave. Penguins, Sea Lions and Flightless cormorants all swimming around. Grey Noddies and Boobies in cliff face. They then too us round into the cove where the visibility was better. Turtles all around and lots of fish. 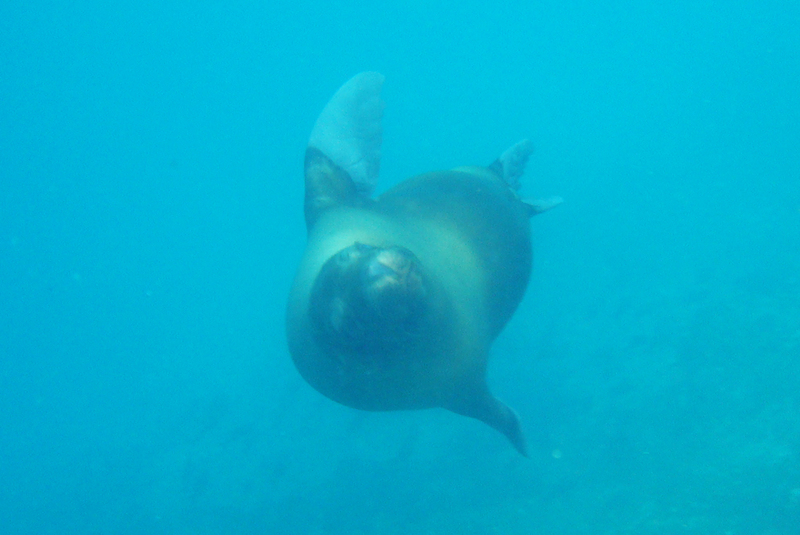 Then the sea lions and fur seals started swimming and playing all around us. Later in the afternoon we explored the cliffs of Punta Vicente Roca on Isabela from the zodiacs. Dave and Mike didn’t take their cameras (as it was slightly raining when we boarded and just enjoyed the experience of seeing all the birds and activity on the rocks. Yet another knackering but wonderful day. Sailed out of the cove and headed north along Izabella. We crossed the equator, not once, not twice, but three times in quick succession, as some people had missed it and Cpt. Douglas kept going round to do it again. What a hoot! Spotted a whale blow 5 times and saw the back and fin break the sea. It wasn’t a blue or a humpback whale, but apart from that we could not identify what it was. We sailed overnight around Izabella. Sea was a bit choppy overnight and some of the passengers were a little sea sick. Day 9 – 10/1/2012 – Santiago, Pinnacle Rock & Bartolome Island. Awoke in excellent birding on Santiago (James) Island at Puerto Egas. Wet landing on the beach. Iguana’s, sea lions and fur seals on rocks near beach. 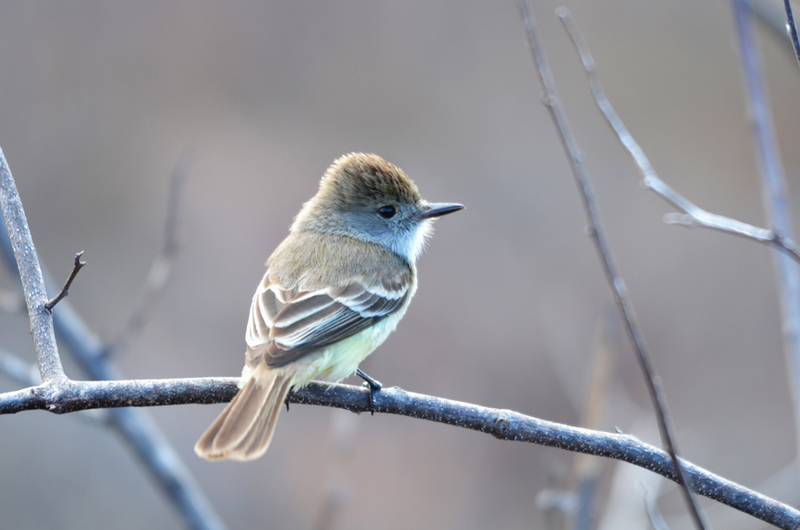 Walked inland a little where a Galapagos Flycatcher took a liking to us, landing on shoulders, rucksacks and even in the end of lenses. Lots of finches and mockingbirds. This was followed by an afternoon snorkel from the beach. Very murky but lots of turtles and fish. Later in the afternoon we sailed over for snorkel near pinnacle rock. Lots of fish, Ray, Starfish and a lovely white-tipped reef shark which swam right past us. This was followed by a walk amongst incredible volcanic scenery up little Bartolome Island – cones, lava tubes and Pinnacle Rock. Lava bombs close to the base of the island, spatter cones and fabulous views. We could see Baltra and Chinese Hat in the distance where we had started our adventure in The Galapagos. 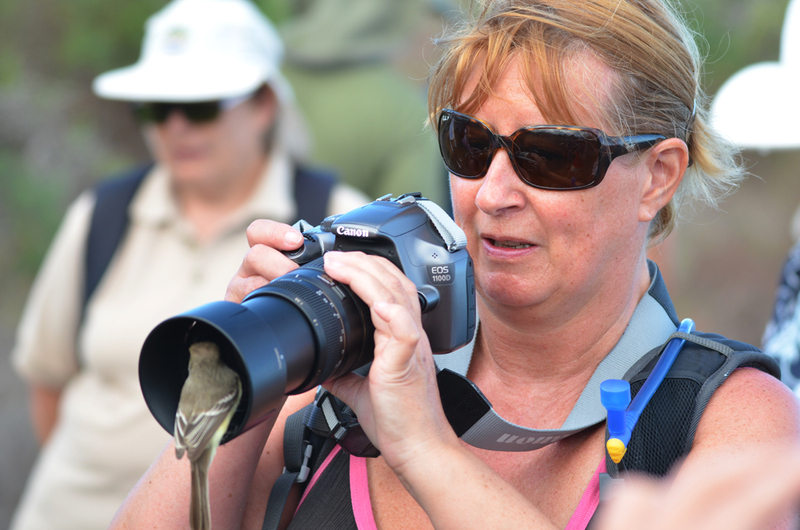 Day 10 – 11/1/2012 – North Seymour Island – Bird paradise? All too soon our last day in The Galapagos dawned. This started with an early morning walk on North Seymour amidst Palo Santo trees and blue-footed booby colonies. There were birds everywhere. Boobies, gulls and frigate birds galore. 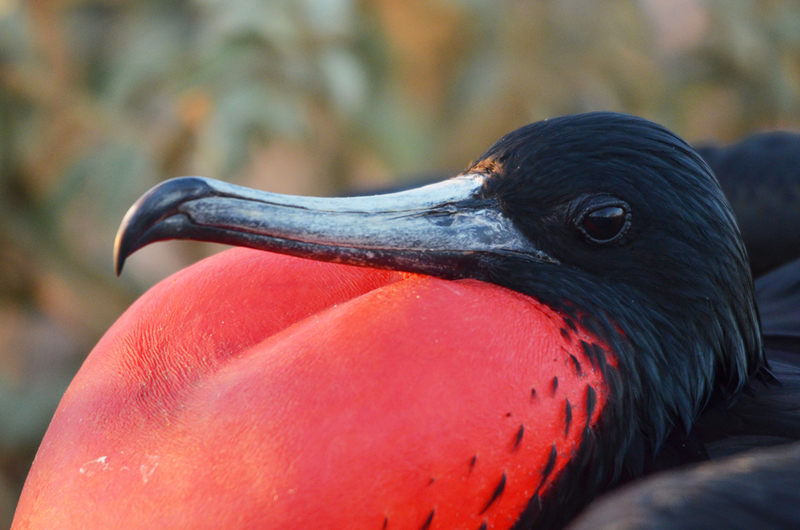 Many nesting and showing mating displays and some male frigate birds with red swollen throat pouches. Absolutely fantastic. Just too much going on. Sea lions and marine iguana’s on the beach with the waves pounding onto the rocks. Unfortunately we were rushed a bit to get this done and all too soon our Galapagos experience came to an end, as we boarded the Cachalotte for the last time. After a late breakfast we disembarked for the journey back to Baltra to transfer to the airport and the flight back to the mainland. 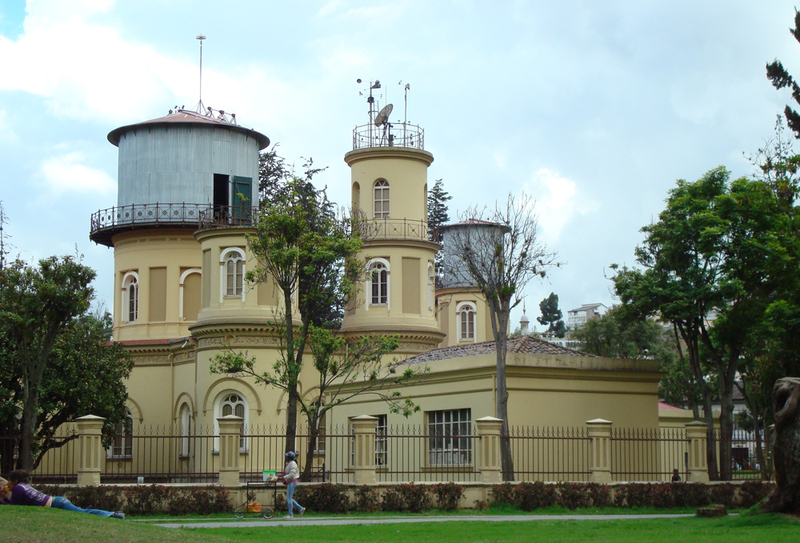 A short stop at Guayaquil is followed by what is often an exciting flight over the volcanoes of the Andes to Quito. But it was too cloudy to see much. We went out with everyone to a fish restaurant in Quito that evening and very nice it was too. Day 11 -12/1/2012 – 50th Dave’s Birthday! Got to make the most of a new place while we were there. As the mountain was clear, we got a cab up to the cable car to take us to the top at 4,100m. Mike and Dave were very breathless. View was fantastic and nearby volcanoes could be seen. The cab driver then took us to the Botanical Gardens, where we looked and photographed flowers and plants. We walked back to the Sierra Madre Hotel stopping at a mall on the way for refreshments. After a siesta we took a cab to a traditional Ecuadorian restaurant. Mike and Dave had a barbecue between them. We booked a cab back but soon realised (once the cab had set off) that the driver didn’t know where our hotel was! He drove around for a bit hoping we would know where we were staying. No chance! He tried radioing to his office, but got no reply. I recognised some road names, but couldn’t see where we were meant to go. Mike had an idea to ask him to take us to the first hotel and get another cab from there once we had got the address. He made his way there and suddenly I spotted our hotel and he was driving past. Phew!!! A whistle-stop tour of Quito for just $5, what a bargain! Our flight to Amsterdam was delayed as volcano Tungurahua, south of Quito had erupted 5 hours before we were due to take-off, sending a cloud of ash into the atmosphere. We had to fly right north first and follow the border with Peru to reach Guayaquil. So a 45 minute flight turned out to be over an hour and a half. We then took off again for Amsterdam for an 11.5 hour flight, not knowing if we would arrive in time to catch our connecting flight to Heathrow. We landed at Amsterdam just an hour before the Heathrow flight was due to leave. We made it safely onto the almost empty plane. Just 30 passengers on a Boeing 737. The flight across was excellent. We had clear skies and excellent views across many of the landmarks of the Thames Estuary and London. We arrived safely at Heathrow, but our bags didn’t! We had to wait until the next fight from Amsterdam an hour later to collect them.